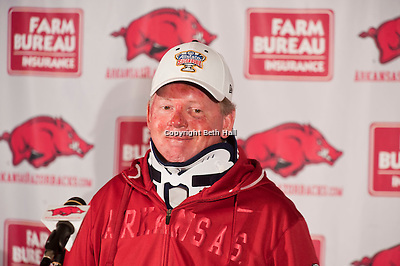 Last week I photographed the press conference following Petrino’s motorcycle accident… two days later s%*t hit the fan. That’s about as far as I’m going to go with comments on the situation, but it’s become pretty interesting here over the past week. I’m ready for a decision to be made so I can take my life off hold… as a photojournalist, I am waiting for the call about a press conference on the fate of Bobby.